Nearly all his weight is on his back (right foot). Right foot is pointed partly outwards. This allows easy power from pushing off the foot. His feet are nearly parallel to the table. This allows him to both put more rotational power into the shot and play a quicker shot, but less power from weight shifting. It also keeps him in position for a powerful backhand. Most players put their right foot at least slightly back for this shot - I do - because you can't really play forehands effectively in a fast rally with the feet parallel unless you train regularly or start early and so ingrain it. It also requires substantial physical training to be able to rotate at the hips, waist, and shoulder as quickly and smoothly as he does, which is needed if you keep the feet parallel. He's dropped his right shoulder. This will allow extra power for topspin. 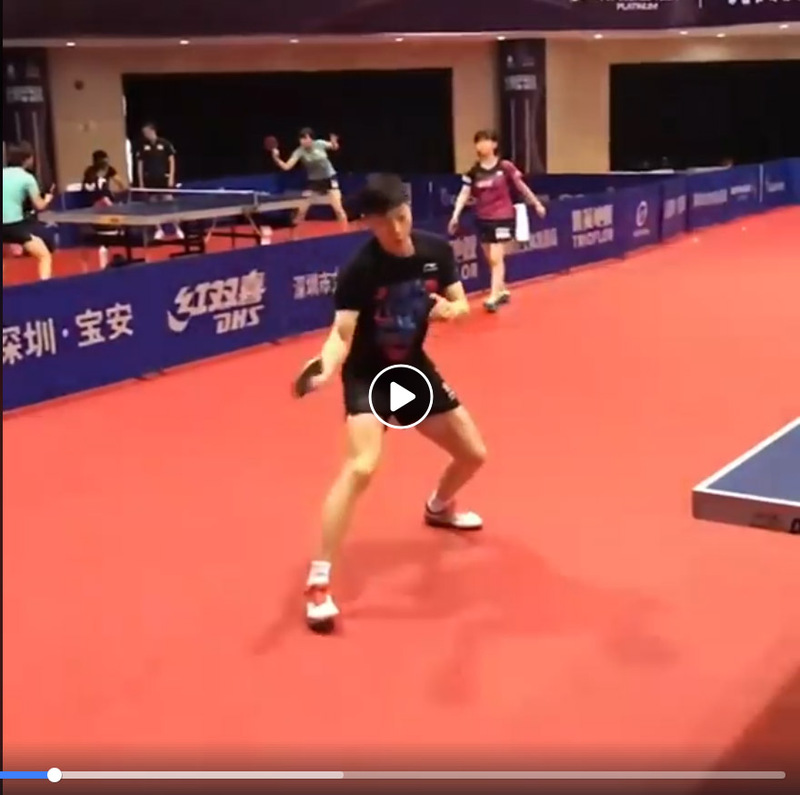 As he loops with more power or plays closer to the table he'll drop it less; if he backs off the table or is up against heavy backspin he drops it more. Arm is close to body. This allows more quickness in the backswing. If you hold it out, it slows you down. Arm is almost but not completely straight. If it goes too straight, you lose quickness; if not straight enough, you lose power. His body is almost completely rotated sideways at the hips, waist, and shoulder. After completing his backswing, he's pulled it his arm away from his body. The wrist is lifted up and back as he prepares to snap the wrist and forearm into the ball. The two go together. It's hard to see the wrist motion except in slow motion or with still images. He's begun to rotate into the ball with his hips, waist, and shoulders. Shoulders are rotating upward and around. Eyes are glued on the ball. He's completely rotated into the shot with his hips, waist, and shoulders. Contact is almost directly to the side, not out in front. If you contact more in front, then that means the body rotation came to a stop so you could get your arm out in front, and so you lose much of your power. Head and body have rotated, but moved only slightly forward. If you move your head and body forward too much during this shot, it makes it hard to recover quickly enough for the next shot, so world-class players often barely move their heads except when going for all-out power. 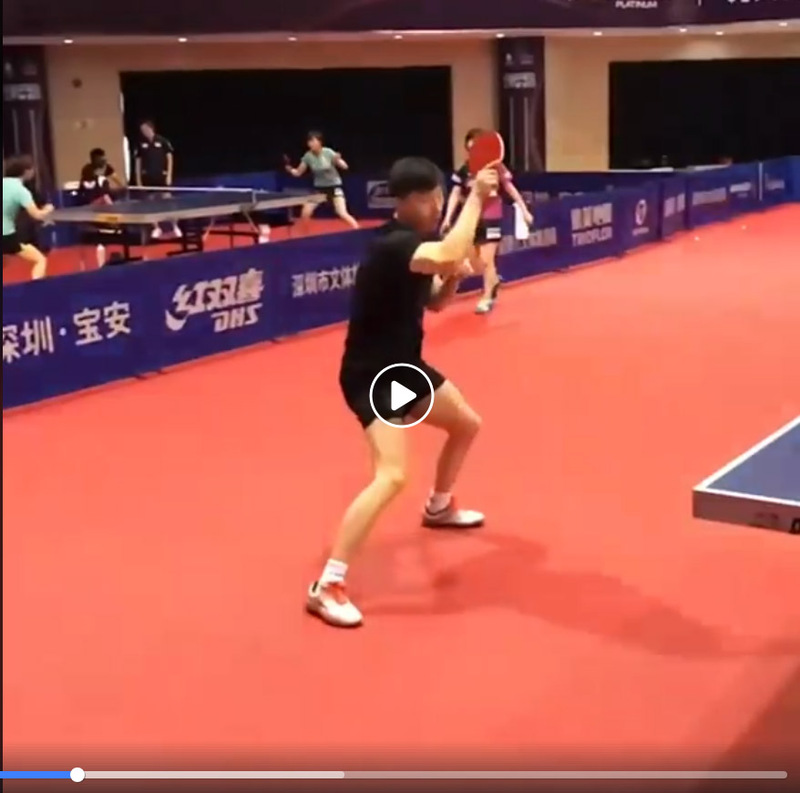 If you watch players who can seemingly loop over and over in rapid succession without backing up from the table, watch their heads and you'll see how they are able to recover so quickly between each shot. Arm and wrist have whipped into the shot. At contact the elbow is maybe around 110 degrees and still closing. He's not watching contact. There's a certain point where you can't really react anymore, so there's no point in watching the ball all the way into contact on such a shot. If the incoming ball is very slow, such as a push or lob, then you might watch it all the way into the racket. Once it becomes pointless to watch the ball, it's better to look up to see what your opponent is doing. His head and body have moved only a little bit forward during the shot as they move mostly in a circle. This allows Ma to start and finish in almost the same position so he can recover for the next shot very quickly. Arm has rotated through the shot and is now at about 90 degrees. Most of his weight is now on his left leg. He's almost instantly using it to push back into position for the next shot. He's completely balanced, as he has been throughout the shot - this is key. He's watching opponent so he can react quickly to the next shot. 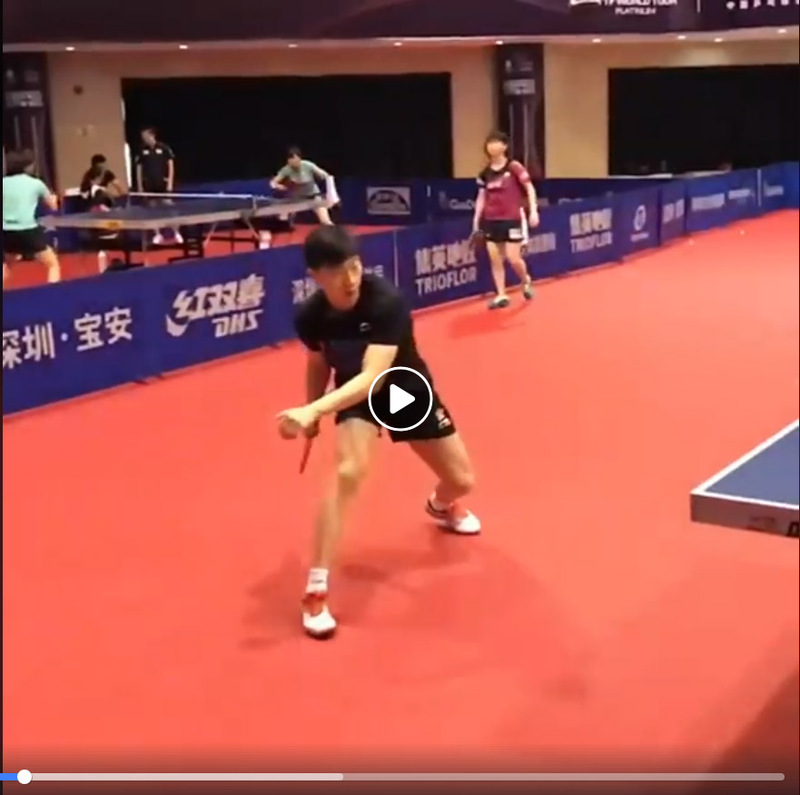 Here's slow motion video of Ma Long looping against backspin starting about 12 seconds in). The main differences here are that there's more upward motion, his head moves more forward (since there's no rush to return to ready position), and if you look closely, now he's using even more wrist. I teach two beginning junior classes each week, on Thursdays and Sundays. We had our final Thursday session of the season last night, with the final Sunday session this weekend. As usual, on our final session we did "player's choice," where the players choose what they want to work on; then we did smash against lob, always a favorite, where they took turns smashing against my lobs and Coach John Hsu's. As usual we finished with games - this time I introduced them to Table Tennis Tic Tac Toe (TTTTT), as demonstrated in this video (64 sec) from Maria Ingles that I posted yesterday. So no more beginning classes until late August - but now it's Summer Camp time!!! Yep, camps all summer long, Mon-Fri. Here's the home page for the event, which starts today in Kitakyushu, JPN, June 8-10. But because they are on the other side of the world, that means their "today" is already done! Here's the Japan Open Day 1 Review (2:02). Here's video (52:22) of world #4 Timo Boll's opening match against Tanaka Yuta (world #331) of Japan. Ma Long is top seed, no Fan Zhendong or Dimitrij Ovtcharov, so there's a good chance of a Boll-Ma Long final in Men's Singles - but Zhang Jike is also in Boll's half. As of this writing, Boll is already in the QF against Kenta Matsudaira of Japan, with Ma Long a round behind and up against Maharu Yoshimura of Japan - followed by a likely quarterfinal clash between Ma Long and Japan whiz kid Tomokazu Harimoto, #10 in the world at 15. On the Women's side, no serious upsets as of yet. Here's the article by Eli Baraty. "I am a great believer in table tennis diplomacy and Diplomacy as a whole. Many years ago a great event occurred called Ping Pong Diplomacy, In short, it's about how China opened their gates to America (click on the link to read about it). A month ago the table tennis world witnessed history once again but this time, I call it Table Tennis Diplomacy." Here's the ITTF article. Japan keeps pumping out these child prodigies! China probably does as well, but they tend not to play internationally or get much public exposure until they are older. Many of the best Chinese first show up internationally when they are already among the top ten in the world or close to that. "Undoubtedly he oozes talent, the popular view being that at the same age he is ahead of Tomokazu Harimoto, a player who has left crowds open mouthed in recent years with wins against celebrated names." Here's the ITTF article. "Winner earlier this year in Lignano and Slovenia, Kelly van Zon of the Netherlands is the most decorated player on duty at the forthcoming 2018 Spanish Para Open which commences in Sant Cugat de Valles on Friday 8th June." Here's the article by Bruce Liu. Here's the listing of 18 movies with lots of pictures! Here's the animated table tennis cartoon (10:54)! 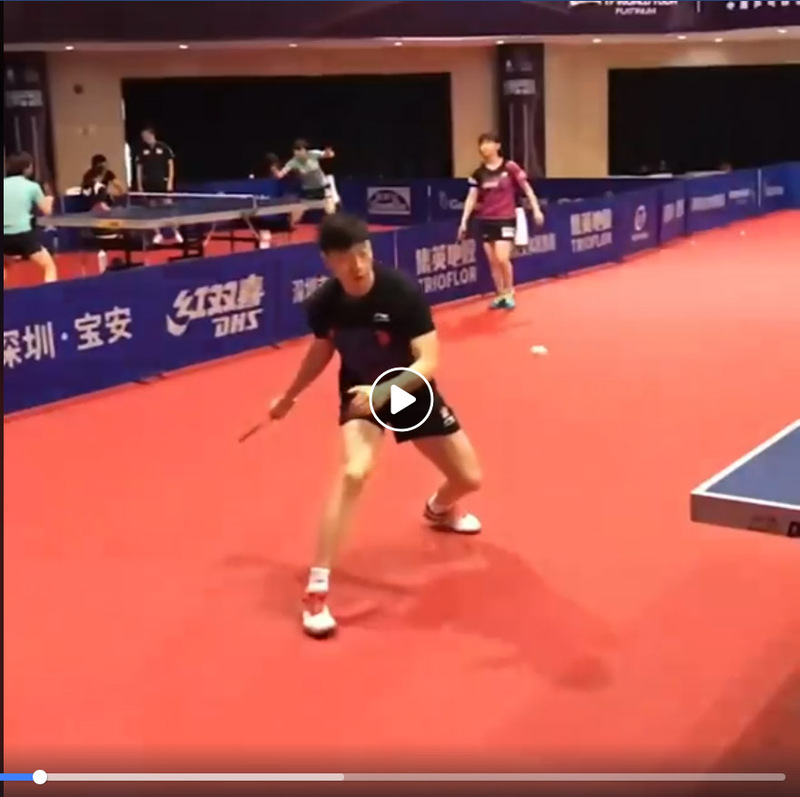 The table is there from the start, but the real table tennis action starts at 1:35.